Some of history's greatest works were penned at an early DIY standing desk! There has been a big boost in the demand for standing desks since the health community has outlined the several health issues associated with sitting down all day. But standing desks are not a new invention; rather, the adoption of a standing desk is a long-lost staple of creative minds that is just now experiencing a resurgence. Throughout history countless creative minds have utilized a form of “DIY” standing desks while drafting legislation or sketching inventions or writing novels. Take a look at some of the most influential thinkers in history who swore by their standing desk. The famed author of The Old Man and the Sea did not use a typical desk at all, in a sense. Instead, he composed many of his renowned works by placing a typewriter atop a small bookcase. According to this lengthy description of his workspace in The Paris Review Hemingway has only a square foot of room to type and collect his thoughts. The nature of his standing “desk,” however, freed him to move about and brainstorm at his leisure while he worked. One of the most important modernist writers, Woolf wrote Mrs. Dalloway and A Room of One’s Own, among many other seminal works. Virginia Woolf used a very particular desk while writing in a room of her own – a tall standing desk with a sloped top that she designed herself. The top of the desk, where Woolf wrote most of her work, contained a painting that her nephew Quentin Bell made himself. This classic desk was acquired by Duke University in 2015 and it is now a part of their private collection. The third President of the United States, Thomas Jefferson had many pieces specifically crafted for his home in Monticello when he could get away from Washington D.C. When he wasn’t writing formative documents for the American government and establishing a nation, he would retire to his massive estate where he would spend much of his time at his desk. Jefferson preferred an adjustable height desk that he could stand or sit at with just a moment’s adjustment. 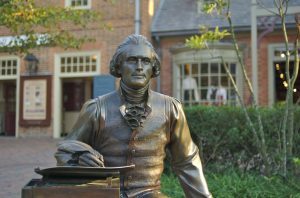 His famed desk is now located in the Monticello Visitor Center. What did Benjamin Franklin not do? 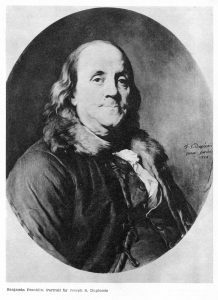 A diplomat, scientist, inventor, activist, and political theorist, Benjamin Franklin is one of the most famous minds of the 18th century. This founding father preferred a long, multi-leveled standing desk that resembled a counter. Not a particular fan of sitting down for very long, the mythic flier of kites would store multitudes of documents and volumes at his desk while he worked on a great variety of projects. For those with money to spare, you can actually purchase a replica of his desk online. Instrumental in bringing about the end of World War II, British Prime Minister Winston Churchill experienced a storied political career and helped defeat the Nazis while remaining diplomatic and level-headed. He didn’t particularly like spending time passively sitting in a chair – while writing letters and forming plans for the war Churchill would stand fully upright at his favorite standing desk, according to StandDesk. Investing in a standing desk may just be the key to unlocking your inner-genius. 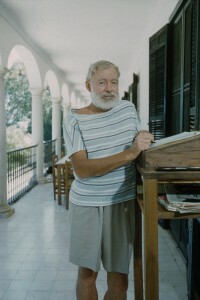 And remember, sometimes you need a little extra help – after all, Hemingway used an animal pellet as an anti-fatigue mat. Technology has come a long way since then: you can use a Wurf board to combat fatigue and relax your entire body while you write the next great American novel (or simply do your homework).